South Korea last carried out its last death sentence in December 1997. Amnesty International considers Korea a de facto abolitionist country, according to a 2014 report by the human rights nongovernmental organization. But the new draft bill aims to raise Korea’s status to an outright abolitionist country, chief sponsor Rep. Yoo Ihn-tae of the main opposition New Politics Alliance for Democracy said, citing decades of efforts by human rights workers to have the practice outlawed here. “It is time we illegalize the death penalty here, in a country that has produced a U.N. secretary-general and is a member of the U.N. Human Rights Council,” Yoo added, referring to U.N. chief Ban Ki-moon. At least 61 have been sentenced to death here, according to Amnesty International. Lawmakers proposed six draft bills from 1999 to 2010 proposing to abolish the death penalty outright. But the draft bills failed to pass Korea’s unicameral parliament. 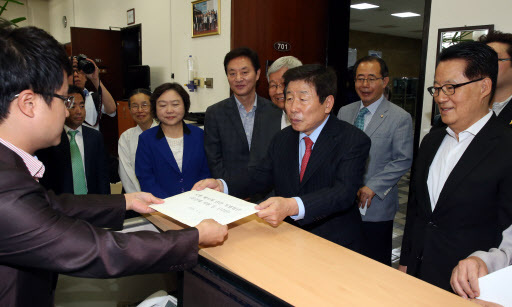 Yoo’s proposed bill comes nearly five years after the last anti-death penalty bill was chiefly sponsored by lawmaker Joo Sung-young of the Grand National Party, a precursor to the ruling Saenuri Party, in November 2010. The draft bill must pass the Legislation and Judiciary Committee and plenary voting at the National Assembly, before receiving final approval from the Cabinet for it to become law. More than 170 of the Assembly’s 298 lawmakers have signed on to the proposed bill as cosponsors. South Korea was among the 34 countries that abstained on a U.N. General Assembly vote to abolish the death penalty in December last year.